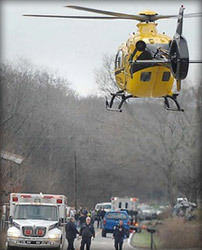 Every year, hundreds of thousands of air medical missions are flown in the United States. These missions provide expedited life-saving care to sick or injured patients when seconds count and at a moments notice. Sadly, these crews do not always return. This memorial honors those individuals who took on the mission in the name of saving lives, but lost their lives in the process. The Air Medical Memorial is the only national memorial recognizing all air medical losses and the only memorial dedicated to recognizing the sacrifice of more than 400 air medical crew members. Join us in honoring the sacrifice of these crew members who are no longer with us by pledging your support today. The Air Medical Memorial, an international memorial, will be located near Denver, Colorado. To learn more about the memorial, the site and to see conceptual drawings, please visit the memorial page. To make a donation, become a sponsor, or learn all the different ways you can help, visit our support page. For information on the 2018 Remembrance Ceremony, click here.